What should be obvious is that the geothermal potential for Japan is superb and that a national effort to displace nuclear power is both feasible and timely. The engineering is mature and readily available. Everyone else has to concern themselves with distance from market impacting the economics which is not a concern here. Even building a super conducting line as a power corridor is an obvious and best use of resources in Japan. Doing all that and Japan will own a safe grid energy system that will be totally paid for in a generation or two that will always be competitive for Japan's needs. The onset of fusion energy is the only present deterrent facing this value proposition and I suspect that the geothermal solution will standup well at least against the heat engine solutions. Either case you are paying for a heat source. It has been nearly 18 months since the 9.0-magnitiude quake that ravaged the Japanese coast. The disaster was responsible for the nuclear tragedy that unfolded at Japan’s Fukushima Daiichi power plant. But despite that tragedy, locals have been finding opportunities for environmental betterment. Before last year’s disaster, the spa resort of Tsuchiyu Onsen drew tens of thousands of tourists. They were all in search of the healing qualities of its piping hot spring water. Now, that same natural resource is about to turn this resort into a trailblazer for the country’s push towards renewable energy. Tsuchiyu is 15 kms from Fukushima. By spring 2014, it will be generating 250 kilowatts of electricity. That’s about a quarter of the city’s total needs. This will all take place at a geothermal plant hidden away in the surrounding mountains. The plant will be the first to be built inside a national park. It’s a controversial move that only became possible after the environment ministry recently relaxed regulations on developing protected areas. If all goes to plan, the project could not only help the town become self-sufficient in power generation, but revive its role as a tourist destination. Visitor numbers dropped because of lingering fears over radiation. In the past, hot-spring operators have been among the fiercest opponents of geothermal energy. That’s because it’s an obvious energy source given Japan’s huge reserves of volcanic water. Many operators fear the geothermal plants would affect the flow and quality of the water, which is pumped up from the depths and then cooled for the benefit of Japan’s enthusiastic bathers. The move also makes economic sense. Under a new feed-in tariff system introduced last month, utilities are required to pay premium prices for renewable energy: 42 yen (about 53 cents) per kilowatt for geothermal power. Resistance to geothermal power has been massive in Japan. Some observers say that’s because the nation has always relied heavily on Fukushima’s nuclear power. But since the 2011 nuclear disaster, the Japanese mindset is beginning to shift. Japan is now able to tap into a resource that energy experts believe has huge potential. According to the trade and industry ministry, its 18 geothermal plants account for 0.2% of electricity output. And no new plants have been built for a decade. Scientists believe the sector’s share could rise enormously. That’s thanks to the feed-in tariff, new subsidies to fund test-drilling, and official recognition that nuclear’s heyday has passed. In the long term, Ikeda believes Tsuchiyu will become a model for other small towns struggling to find clean and stable sources of energy. Hi there! Thank you for sharing your thoughts about Geothermal in your area. 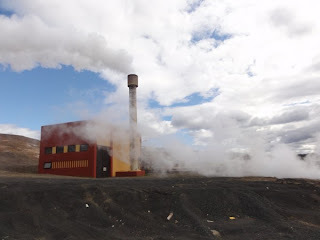 I am glad to stop by your site and know more about Geothermal. Keep it up! This is a good read. I will be looking forward to visit your page again and for your other posts as well. The binary cycle power plant was first demonstrated in 1967 in Russia and later introduced to the USA in 1981, following the 1970s energy crisis and significant changes in regulatory policies. This technology allows the use of much lower temperature resources than were previously recoverable. In 2006, a binary cycle plant in Chena Hot Springs, Alaska, came on-line, producing electricity from a record low fluid temperature of 57°C (135°F).